The subject of this review is a product called Home Health Antifungal Lotion. This product is a primarily natural substance which can relieve you of fungal infections and their painful and uncomfortable symptoms such as the burning sensation felt near rashes, the cracking or scaling of skin caused by irritation, and the general discomfort a fungal infection can cause. These infections are caused by various species of fungus, such as tinea pedis, cruris, colloquially known as athlete’s foot, jock itch, and ringworm, all of which are eliminated by Home Health Antifungal Lotion. If you are interested in further information regarding this product, then keep reading. The key active ingredient in Home Health Antifungal Lotion is tolnaftate, which is one of the more common anti-fungal agents. It is widely used due to its effectiveness. The method it applies is identical to all other anti-fungal substances. Basically, tolnaftate prevents the further creation of fungal cell membranes by inhibiting the production of a key element used in the process. The extensive use of natural oils helps the product effectively soothe the feet, and nourish them, giving this product added benefits. It is not just a treatment of fungal infections. 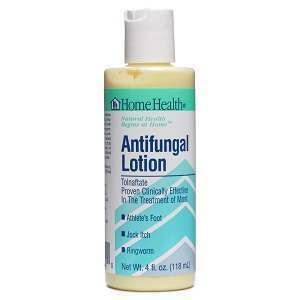 Like with every other anti-fungal products currently available on the market, the usage instructions for Home Health Antifungal Lotion are fairly simple. You must wash and dry the infected area before applying a thin layer of the lotion. Rubbing the substance into the skin will increase effectiveness, as this way the substance can reach the pores. Take care not to bring the lotion in contact with your face or eyes. Children under the age of two should only be treated if instructed to do so by a doctor. Even more so than other similar products, Home Health Antifungal is prone to causing allergic reactions due to the high quantity of natural substances in the formula. The usual offenders are skin irritation, rashes, and pretty much every symptom the lotion is supposed to cure. Constant sneezing, eye irritation and breathing issues are just a few side effects that can occur when using this product. However, it must be noted that these cases are all extremely rare. Home Health Antifungal can be purchased from many re-sellers. This review was created with information we found on Amazon, where a 4-ounce bottle costs $9.38. If your purchase exceeds $35, then you won’t need to pay for shipping. Each re-seller enforces their own money-back policies, so getting a refund isn’t guaranteed when using this product. The customer reviews, of which there are many, are positive. Home Health Antifungal is an effective and natural product with a fair price. The increased risk of side effects, combined with the lack of a guarantee policy prevented us from being able to wholeheartedly recommend this product. Jimmy Rodriguez	reviewed Home Health Antifungal Lotion	on June 10th	 and gave it a rating of 2.5.